I’m a little late getting this post out, this weeks update was met with one disaster after another. After overcoming two flat tires last week, our AC decided to go out at the same time our oven went kaput! All while this little stink of a head cold was starting to rear its ugly head. Hopefully, this is just getting the bad out of the way in time for our little boy to come into the world. 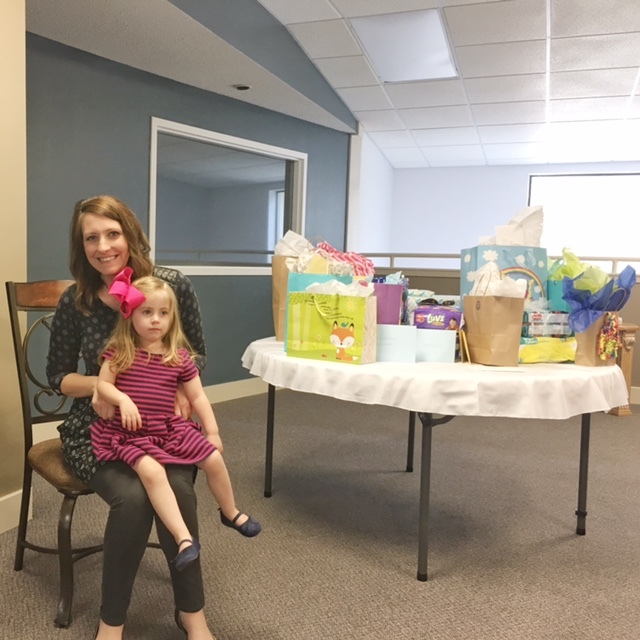 This past week, we were showered with gifts from our gracious Church ladies. It is such a blessing to have such a wonderful support group and great friends. Aspen was such a great big sister helping me unwrap the gifts and show them off. And here we are, right at week 36. Baby Size: This week baby Wes is racking on the pounds and should be around the size of a cantaloupe at 6 lbs. He should also be maxing out his height at 19-22 inches, although I have a feeling this little fella is going to be on the tall side. Symptoms: This week’s new symptom is sciatic nerve pain. Thanks to baby Wes’ growth spurt, he likes hanging out on that nerve which sends shooting pain down my leg. Speaking of legs, we can add swollen ankles to the ever-growing list of ailments. Sleep: My 2 hours of insomnia at night continues to plague me this week. I’m certain at this point there is no cure. Cravings and favorite foods: It’s been a while since I’ve had one of those strong cravings, but this week I am wanting Pulled Pork BBQ Sandwiches. Usually I’m not a BBQ fan, so this is certainly one of those weird pregnancy cravings. Mood: Impatient. This week my impatience with people has hit an all-time high. I apologize in advance. Maternity clothes: I’ve hit a new stage in this pregnancy, I’ve outgrown my maternity clothes. With hopefully less than a month to go, I’m really against buying new clothes which means being creative with coverups and even going crazy casual in some of Chris’ t-shirts. Buying: This weeks purchase, well actually delivery, is the rug I ordered for the nursery. After 2 months and 3 missed ship dates, I finally received the nuLoom rug I ordered on Amazon Prime day. Just one of the last few finishing touches I’ve been waiting on for the nursery. « How To Have The Best Yard Sale Ever!